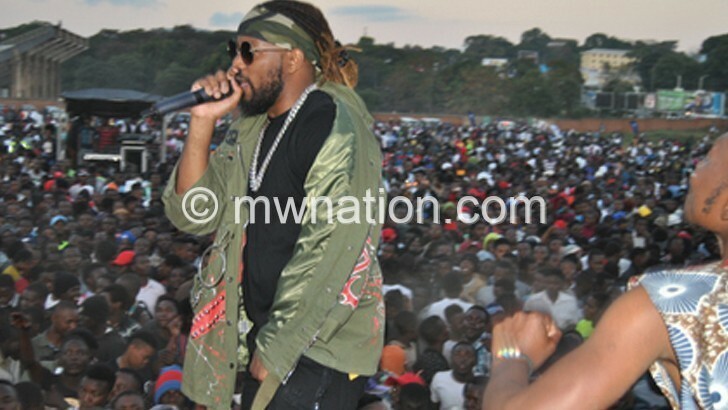 It was an afternoon of fun, music and dance at Kamuzu Stadium upper ground when hip hop artist Tay Grin held his much-publicised ‘free show’. Billed as a ‘thank you’ show for his fans for voting for him during the recently held Nyasa Music Awards, Tay Grin real name Limbani Kalilani started the show by giving the platform to up-and-coming artists. Supported well by corporates such as Malawi Broadcasting Corporation (MBC), FDH Bank, Nali Group of Companies, Capital FM, Knights and Knights legal firm and Fattani Printers, the show was patronised both by the young, who dominated, and the old. “Blantyre, I want to say thank you for supporting my music. Thank you! Thank you! Thank you!” said Tay Grin when he jumped on stage at about 4pm. He went on to dish out some of his hits such as Sugar Mummy, Tola, Chipapapa and Two by Two. With support from DJ Nathan Tunes on the decks, Sonyezo on stage and Forus Dance Crew from Dzaleka Refugee Camp, the reaction from patrons proved that Tay Grin is popular among urban music lovers. However, artist Vube almost stole the show earlier with his performance of a song Chindekha. Then there was violin artist Lucent Shaba who also impressed. Speaking in between performances, MBC spokesperson Chembezi Mhone said the public broadcaster has an obligation to support local talent. “The music sector is growing but at a small-scale because it has not gotten the support it deserves. As MBC, we support local music through various programmes such as Made on Monday which helps artists get the exposure they need,” she said. Mhone reminded the patrons that MBC strictly plays strictly local music on Fridays. “It is our obligation to play our part in promoting local things as part of the Best Buy Malawi Campaign,” she said. While the show was on, the youth were encouraged to get their blood tested by Malawi Aids Counselling and Resource Organisation officials. Free condoms were also distributed.